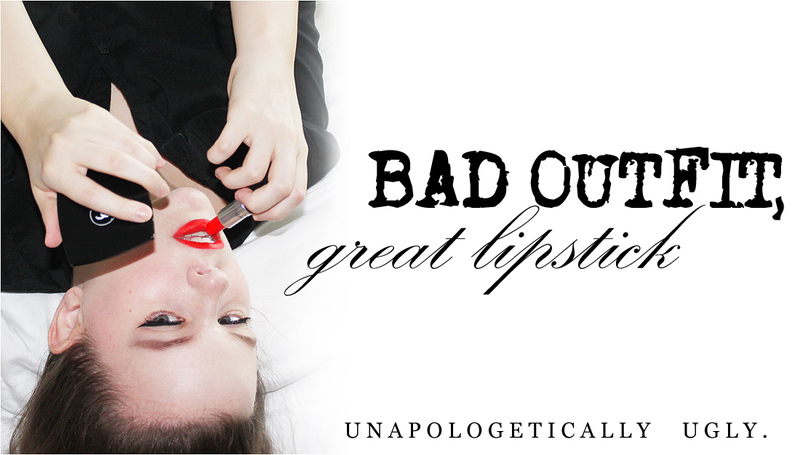 It's not at all shocking that I love lipstick and own a lot of it. I've also accepted that while I may not own as much as some bloggers and YouTubers, I own more than most of my friends, even some of the drag queens. 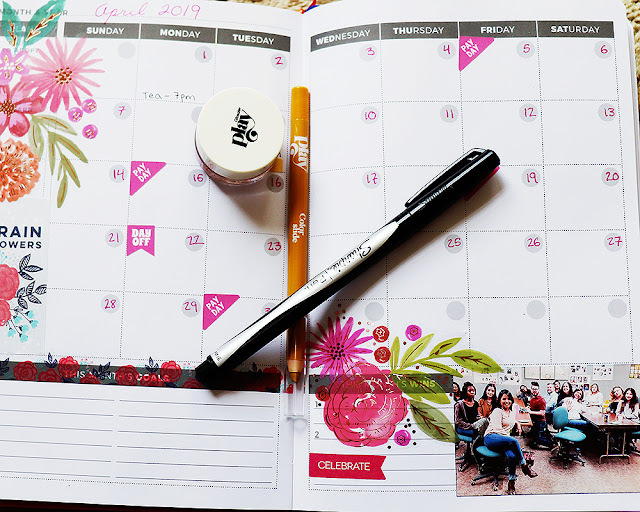 Most of my friends who wear makeup only for work or special occasions and aren't especially in to "beauty" have all of two tubes of lipstick, banged up and lurking in the bottom of their makeup bag or jammed in to a drawer at their desk. That's fine. I've made my peace with this. I do enjoy every shade I have, though, and I want to make sure I get as much use out of them as possible before they turn. 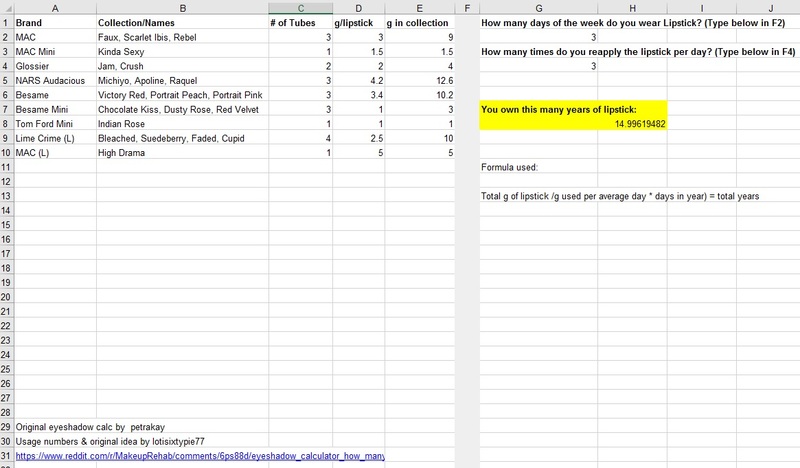 So when somebody on Reddit's Makeup Rehab sub posted a downloadable lipstick calculator, I figured, "Hey, why not? Let's see how long my collection will last." You just plug in how many of each type of lipstick you have, how many grams each of those lipsticks is, how often you wear lipstick, and how often you reapply lipstick when you wear it. Easy! No fuss! Does that legitimately say that, at the rate I'm going, it'll take me fifteen years to finish my lipsticks?! Okay, okay, so that's terrifying. But you know, I estimated that I only wear lipstick three times a week. I sometimes wear it more frequently, say 4 or 5 times a week. Let's try that! That might be less scary. Technically, 9 years is much better than 15. And to be totally fair, there are some lipsticks you'll reapply more than 3 times a day; I wore Glossier Crush to work yesterday, for instance, and because it was a long day with a lot of talking, I reapplied the lipstick a solid 4 or 5 times. You also have to layer lipsticks like the Glossier Generation Gs for the color to show up. But even then, that's a bit of a cop-out. For every lipstick I reapply frequently, there's one that needs touched up once a day tops, like the Besame reds or the iron-clad Lime Crime Velvetines. I may wear those Glossier lipsticks to work from time to time, but when I really want to look good for a while, I go for those fullproof formulas that almost never need reapplied unless you've eaten a big meal. 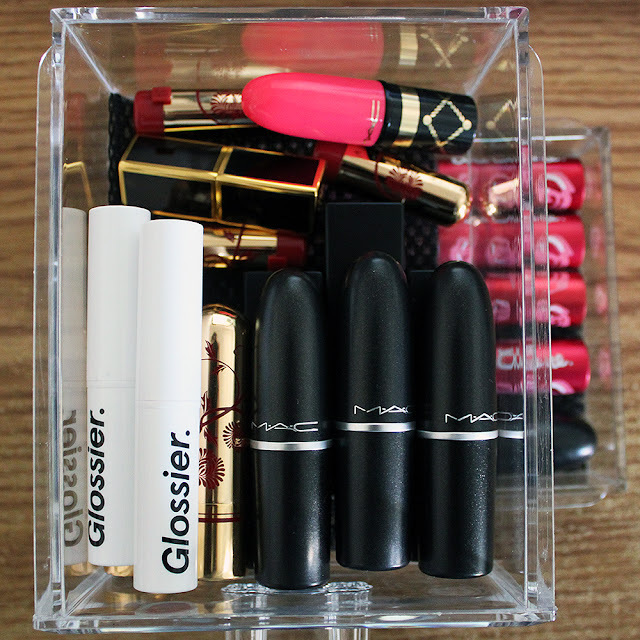 Most importantly, years of lipstick is still years of lipstick. And I have yet to meet the lipstick that lasts a decade. I'm already on a lipstick no buy for the rest of 2017, and I'm doing pretty well. I've received a few new shades as gifts (MAC High Drama and Tom Ford Indian Rose), and I took advantage of the Back2MAC recycling program to get MAC Rebel. But I haven't gone out of my way to buy new lipsticks, even when a sale was happening. Instead, I've tried to pay attention to what's already in my collection. 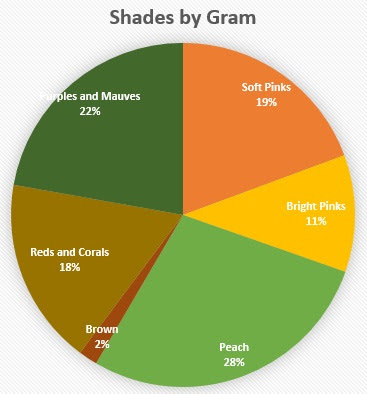 I see this and I say, "Man, how is it that over a quarter of my lipstick collection is peach?!" Well, it's because two of my five peach lipsticks are quite hefty--NARS Apoline and NARS Raquel are 4.2 grams each. By contrast, my one brown lipstick is my mini Besame Chocolate Kiss, which only contains 1 gram of product. 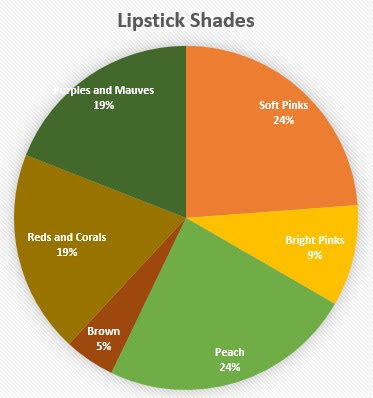 I've decided to combine these charts with how old my lipsticks are and how often I reapply each shade. Most of that purple pie chart slice represents new shades (MAC Rebel and High Drama), and Glossier Jam is relatively easy to run through because it's sheer and needs reapplied regularly. Other tubes have been around for quite a while, and I drag my feet on using them for different reasons. I'm still mildly paranoid about finishing MAC Scarlet Ibis, for example, because it was a limited edition shade and one of my most perfect reds. 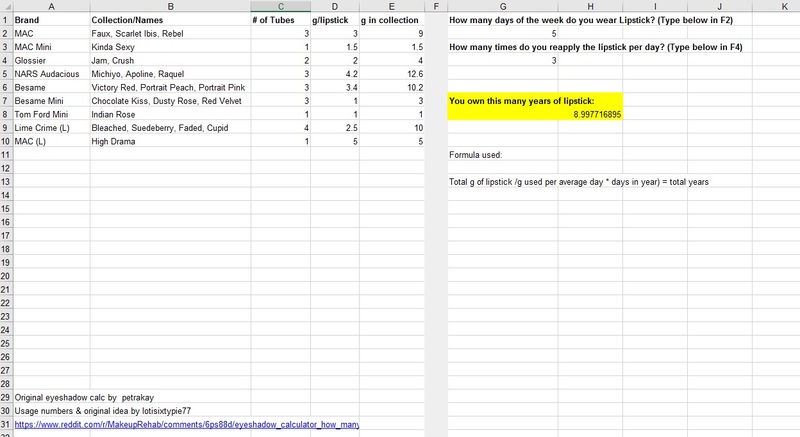 But this is a silly way to think, because it'll just go bad if I don't use it, pretty much every lipstick shade is dupable, and--most importantly--this lipstick calculator has shown me just how long my collection will last me. I won't be continuing the lipstick no buy in 2018, just because I'd like the option to replace a lipstick if it goes bad or try a new formula that piques my interest. 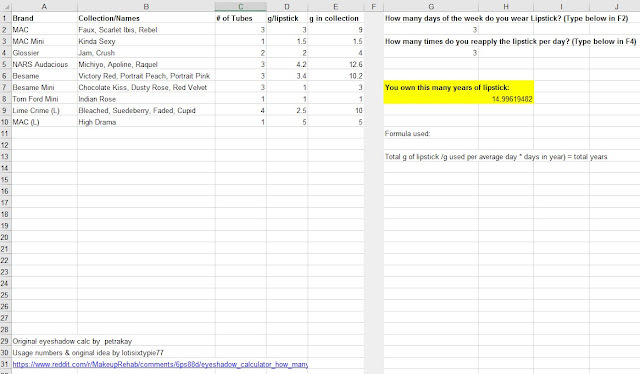 But I have a strong feeling that these calculations will make me hesitant to expand my collection. For instance: if I buy a new lipstick, I'll likely want to purge one that's already in my collection so I can keep up. 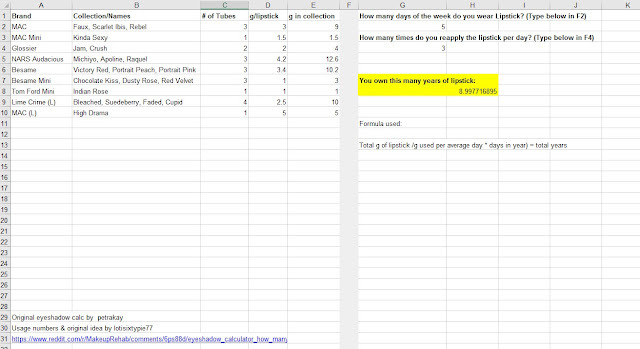 Realizing that I own 56.3 grams of lipstick, and a single gram lasts the average person many months? That was another wakeup call I needed on my "save more money" journey. I'm totally going to do this when I have a free evening! I wear lipstick every day, but I also have many more lipsticks than you, so I shudder to think what my result will be. I've gotten much better at resisting lipsticks that I know I won't wear regularly, but I'm still far from perfect, and I might try a lipstick no-buy for the first half of 2018. Wow, so illuminating. Thanks for killing our lipstick lemmings! Love the ones you have before they go bad.